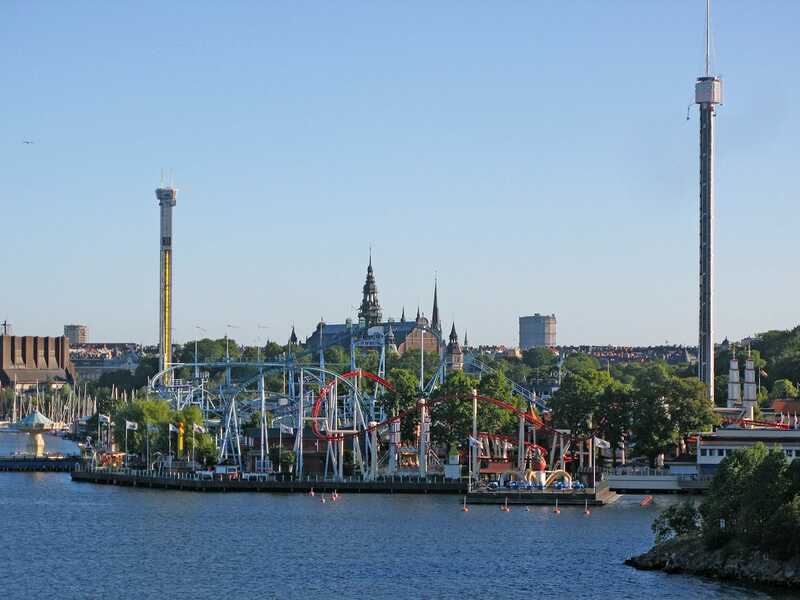 Gröna Lund is a park that I've wanted to visit for many years now. This is always a recipe for potential disappointment, though I'm delighted to say that the actual park was even better than I'd imagined it, though oddly enough for a completely unexpected reason; Fritt Fall. During the course of the day my group clocked up fifteen separate rides on this eighty metre tall drop tower, meaning that we were dropped more than a kilometre in total. Though the drop was a great rush in itself, the best bit was the magnificent view of downtown Stockholm from the top. Cameras are not permitted on board unfortunately, for very obvious reasons, so the reader will just have to take my word when I say that the city is one of the most beautiful in the world. One day I'll have to come back here and play the part of a proper tourist. On a past trip to this part of the world, my five seconds of fame came in a short clip of me raving about BonBon-Land for the evening news in Denmark, the first and probably only time I expect to be subtitled in Danish. During one of my waits for Fritt Fall I was accosted by a charming Swedish blonde, who unfortunately happened to be a journalist (maybe next time!). 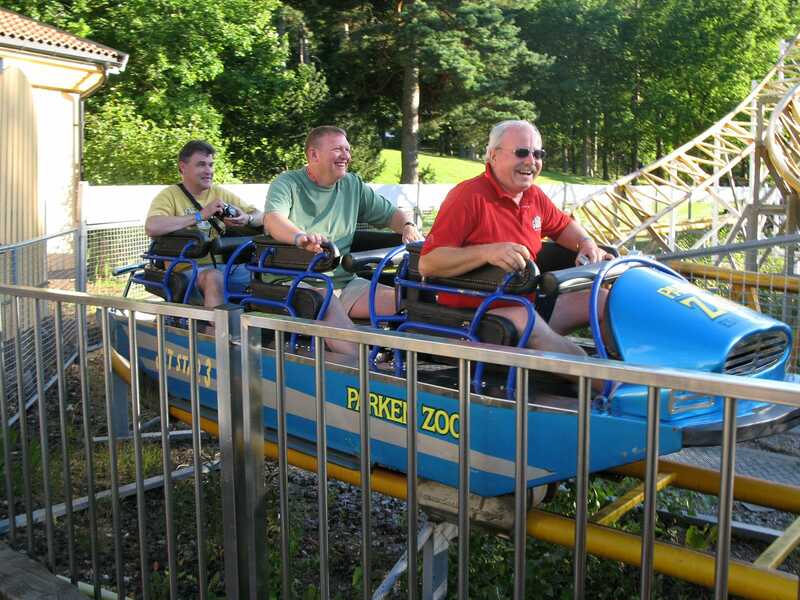 I was asked to explain why we came all the way to Sweden to ride roller coasters, and I managed to rattle off a half decent answer on the spur of the moment, though as I write this I've absolutely no idea what I said. Maybe I'll hear it later. There was another completely unexpected gem in the guise of Kvasten (#994). Though undisputedly a family coaster, and a relatively gentle one at that, the ride marks the debut of a new train design from Vekoma, featuring very comfortable inverted seats with lap bars only. The design is in a word, magnificent, and deserves to be retrofitted to the remaining Vekoma family coasters as a matter of urgency. Though it is sacrilege to even think such things, I'll be truthful and remark that, for me at least, it was the more enjoyable coaster than Jetline (#995). Before I find myself burned at the stake for that comment, the Schwarzkopf creation had too many nasty jolts in it for repeated riding, a sharp contrast to the near clone that once lived in Japan. Vilda Musen (#996) is a mouse coaster that was designed to fit in and around Jetline's superstructure. This makes for some excellent near miss moments, including one where it gets mighty close to the park space shot, Katapulten, also a good ride in its own right. Sadly the timing wasn't quite right for us, insofar as Jetline spent most of our ride in the station. Perhaps if we'd ridden again we might have been more lucky, but given the size of the queue that was completely off the cards. Possibly the funniest moment of the morning was had approaching the queue for Nyckelpigan (#997). There had to have been sixty club members in the line in front of me, maybe even a few more, and the three or four local children waiting for their favourite ride were stuck in their midst. It was all I could do not to laugh as train after train of loudly screaming club members went past on a ride that gains a top speed of sixteen miles per hour. The rest of the day was spent on three attractions; a moderately decent ghost train by the name of Blå Tåget, a very good fun house called Lustiga Huset, and a positively excellent haunted walkthrough designated as Spökhuset; my apologies for the last verb but my computerised thesaurus couldn't give me anything better. I've got no intention of spoiling the surprises for the reader, but suffice it to say that there were several moments that made me jump, and we saw at least two small children exiting half way through the attraction while we queued. In the interests of diplomacy I'm going to constrain this report to a brief note to say that I was able to have one ride on the Masken (#998) and one ride on the JetStar (#999). As a coach captain it fell to me to be the last person to leave the ride area, an hour after park close, and I made a point of thanking both ride operators for working an extra hour on our behalf.